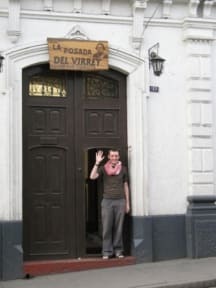 La Posada del Virrey i Arequipa, Peru: Reservér nu! 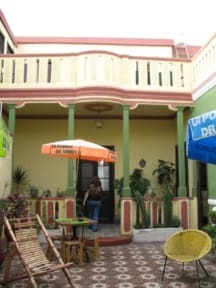 The hostal is close to the main square of Arequipa, the Plaza de Armas. The hostal is owned by a friendly family. Basic but clean singles, doubles, and dormitories with and without bathrooms are available. The rooms of the property surround a courtyard, and there is a rooftop terrace where you can escape the hustle an bustle of the streets when needed. There is also a BBQ on the rooftop and free kitchen facilities. Free internet access (computer available, but also WiFi), kitchen, hot water (24 hrs), free coca/tea, and baggage storage (security box) and it is possible to change your money there. Laundry and breakfast for a small fee.